MySolidWorks is a web portal that helps you be more more productive by connecting you with relevant SOLIDWORKS® content and services—anytime, anywhere, and on any device. With MySolidWorks, you can get answers about SOLIDWORKS, learn more, and connect with manufacturers. 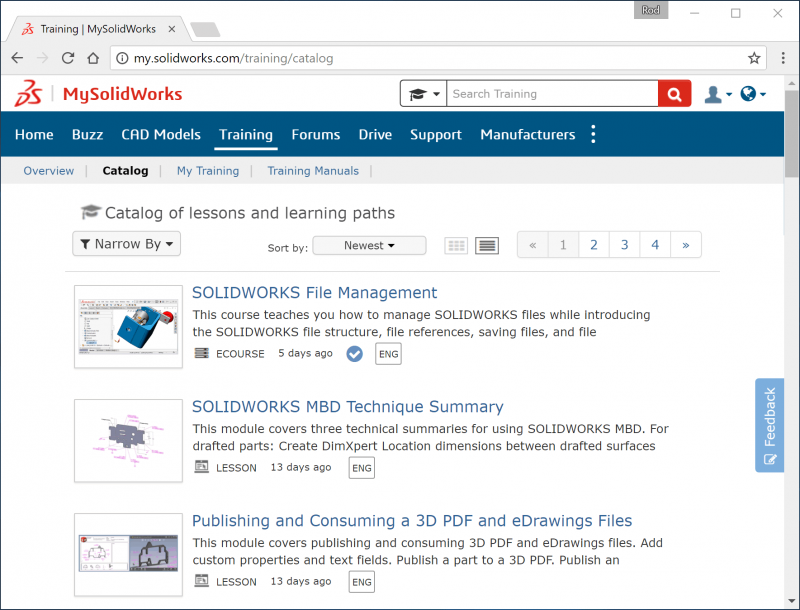 MySolidWorks provides access to library of SOLIDWORKS training videos, enabling you to expand your knowledge on your own schedule and at your own pace. Video lessons complement SOLIDWORKS instructor-led training classes. You can add lessons to your personal training plan to take at a later time and track your progress. For users who want to learn and attain SOLIDWORKS Certification. Provides access to SOLIDWORKS certification preparation courses, extended online training with 1000+ training videos. *For users with active SOLIDWORKS subscription. $360 per year, per user. An additional SOLIDWORKS Subscription Service. Provides 600+ introductory SOLIDWORKS training videos, online storage services for sharing designs, and a worldwide network of manufacturers who can help bring your designs to life. *Exclusive account designed for SOLIDWORKS Subscription Service customers. Improve skills and get SOLIDWORKS certified. Helps students boost their SOLIDWORKS skills by connecting them with relevant SOLIDWORKS content and services – anytime, anywhere, on any device. Students with the best SOLIDWORKS skills often get the best jobs. *Available to a student while their student license is valid. Search – Get answers to questions from across all SOLIDWORKS community resources. Access Learning – SOLIDWORKS training videos. Access to the SolidWorks Customer Portal, explore and search Advanced Forums, and the Knowledge Base. Access to MySolidWorks Manufacturing Network which connects SOLIDWORKS users and reliable manufacturers with 3D Printing, Sheet metal, CNC Machining and Injection Molding capabilities. Cloud File–Storage Services Share large design files via Dropbox, OneDrive, Box, Google Drive, etc. View your CAD files online with eDrawings. Access to My VAR provides you with Javelin content feeds for SOLIDWORKS blogs, videos, news, and a schedule of upcoming events. MySolidWorks provides access to hundreds of SOLIDWORKS training videos, enabling you to expand your knowledge on your own schedule and at your own pace. SOLIDWORKS Solution courses for MBD, Composer, Simulation etc. SOLIDWORKS Part Modeling, Sheet Metal Design, Assembly Modeling, Mold design, and much more. A classroom is one of the best ways to learn SOLIDWORKS, but sometimes it’s not possible to attend a live class. You need the convenience to learn what you want, where you want. 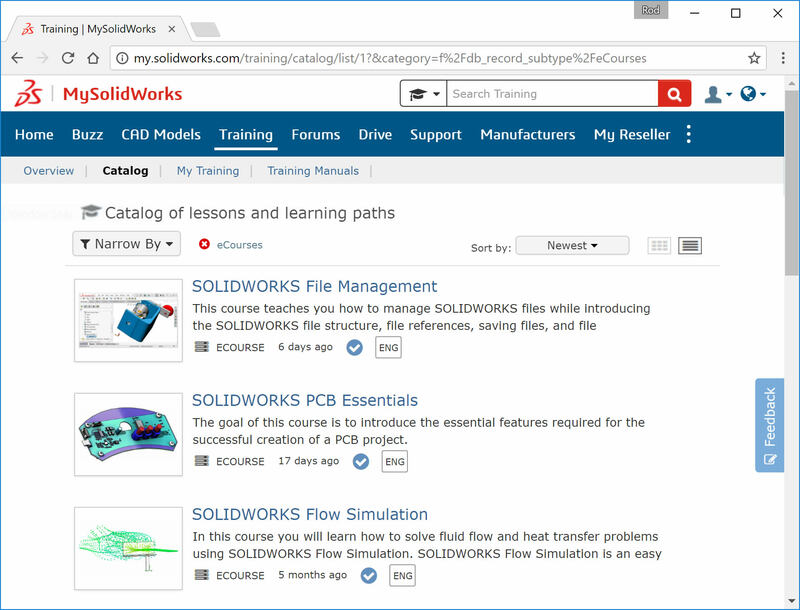 SOLIDWORKS now has a library of self-paced, high quality, interactive eCourses that offer learning on your schedule. 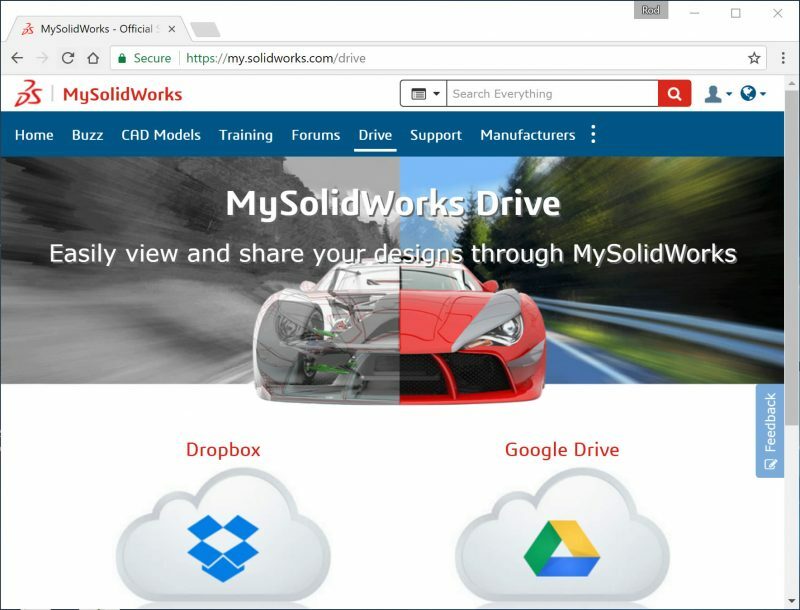 MySolidWorks Drive connects cloud-based file storage services, such as Dropbox and Google Drive with MySolidWorks. MySolidWorks Drive enables SOLIDWORKS users to view their designs online with the eDrawings online viewer and easily share large design files with manufacturers, colleagues and vendors from anywhere. Training YouTube videos, plus our latest news, and a schedule of our upcoming events such as webinars and seminars. We have also included our Stratasys 3D Printing blog to keep you informed about the latest additive manufacturing techniques and products. The MySolidWorks Manufacturing Network is designed to connect SOLID WORKS users and reliable manufacturers with 3D Printing, Sheet metal, CNC Machining and Injection Molding capabilities. 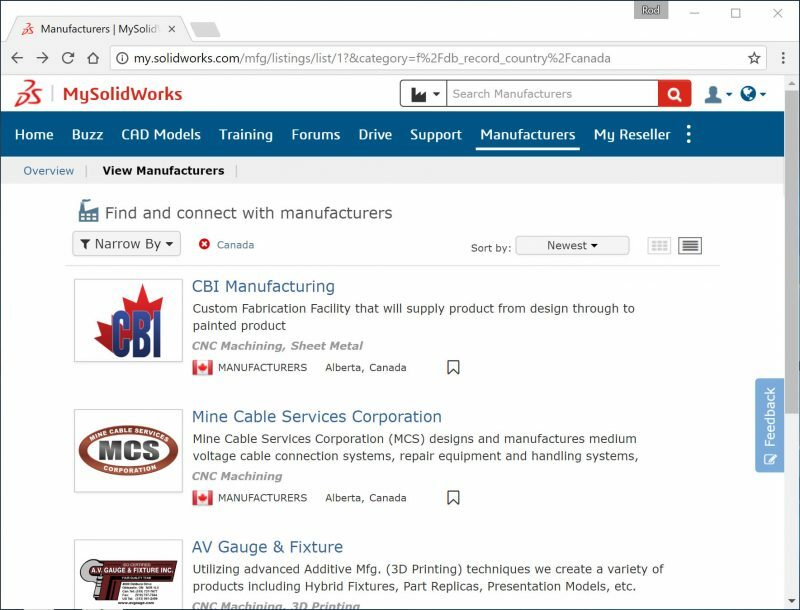 Available today – Manufacturers can register to get listed on the Manufacturing Network and SOLIDWORKS users can recommend manufacturers to be added. Coming soon – SOLIDWORKS users will be able to find and connect with these manufacturers to get physical parts made fast while manufacturers will be able to reach SOLIDWORKS users more directly to promote their services and respond to RFQ’s. Search, view, and download CAD models from 3D ContentCentral from within MySolidWorks. Includes: Electrical components, Architectural items, Mechnical hardware, pneumatic components, and much more. *No download or installation required!